A philosophical concept that lies in the heart of Tomiki's Budo, "Mushin Mugamae." "Mushin" is a state in which the mind lets go from itself, no longer seeing things as "this and that, good and bad, right and wrong, gain and loss, life and death-all which must be seen as a oneness." "Mushin" is a mind undisturbed by effects of any kind from which proceeds a "flowing mind and body" and making possible the performance of skilful technique without "conscious efforts made to generate and sustain it." Mushin is the Zen concept of “no mindedness,” a state in which there is no preconceived thought that interrupts the flow of physical action. 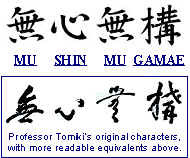 Mu means “nothing, empty, or no.” Shin means “mind or heart” in both the physical and in the spiritual sense. Thus in terms of Zen, there is no separation between thought and emotion. To feel it is to think it; to think it is to feel it. The corollary of "Mushin" is "Mugamae", the body adopting the posture or stance appropriate to any situation without the conscious direction of the mind. With no preconceived thought or emotion, action will be one with thought and emotion. Thus to think it and to feel it is to do it. A circle is always balanced. There is no distinguishing top or bottom, left or right. It has no point or goal but to be a circle. The planet Saturn represents the eternal rotation of the solar system. Should the planet cease to rotate, it will be destroyed, and harmony will cease in the universe. The planets affect the tides, the never-ending flow of water. Should the oceans cease to flow, stagnation will occur. Stagnation in the physical world and in our personal lives will bring about defeat in martial arts and in life. The planet Saturn is bound by its rings, which represent constraint and control. The planet Saturn in harmony with the universe and its own self-contained cosmos, therefore, represents the mindless circle. Training in martial arts is meaningless unless it leads to the continual perfection of the practitioner, despite the outside forces of negativity and darkness that constantly work in opposition to spirituality and the light of hope. Thus the way of Mushin Mugamae is “the way of the mindless (endlessness) circle.” There is not always a specific goal in a martial arts technique or in life. In most martial arts systems, the techniques have an “end in mind.” Too often the goal is to hurt or maim an opponent. These techniques can also be easily countered, leaving the practitioner with no options. The circle stops. But a technique designed to be a means of achieving harmony with an opponent’s flow has many options. Since the technique has not been predetermined, it will be difficult to defend against. Because the end is not in the martial artist’s mind, it does not exist until created in response to the flow of combat. Also in reaction to an opponent’s attack, a strike can become a block; a block can become a strike, with or without power. A strike can even turn into a pat on a potential opponent’s back should the moment of conflict be eliminated prior to a physical confrontation. The correct technique will occur when the martial artist is in the flow of the mindless circle. A momentary defeat is only a chance to create another artistic endeavour based upon achieving the harmony contained in the mindless circle. Even in defeat if a martial artist is in the flow of the endless circle, the defeat can become a means to spiritual and physical regeneration. The defeat becomes a victory, and the circle is completed. Even in life’s every day endeavours, many individuals always look for ends or achievements and often lose sight of the means necessary to attain those goals. A missed opportunity in life is merely a chance for those individuals to aspire to another—perhaps more exciting—achievement that would never have been realized had their original goals been attained. Thus no antagonist and no political or social force can prevail in an attempt to thwart their attainment. But the problem is that many times those same individuals have looked only forward to that far off goal, and they failed to create the short-term means that would help them achieve that end. Unless they develop the skills necessary to achieve that goal, the goal will never come. If the perfection of a particular martial arts technique is a goal, it is first necessary to develop the timing, balance, speed, and power needed for proper execution.